Polk County Sheriff, Ken Hammack, addresses the East Texas Peace Officers Association. 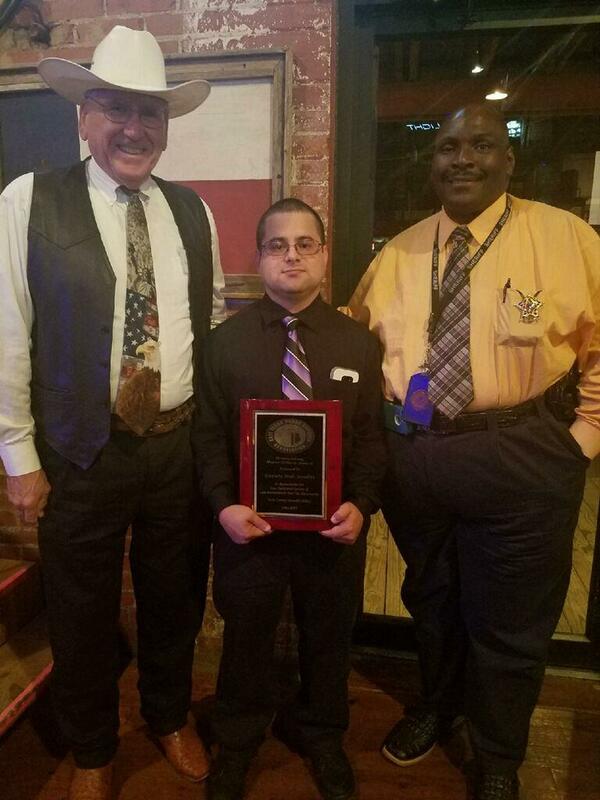 Deputy Josh Sanders Recognized for Courage Under Fire, LIVINGSTON, June 30, 2017 - The East Texas Peace Officer’s Association recognized Deputies with the Polk County Sheriff’s Office with two different honors. Sheriff Hammack the 2nd Vice President of the Association presented Deputy Josh Sanders with the ETPOA Outstanding Peace Officer Award for his for his bravery under fire on March 7, 2017. Sheriff Hammack also presented Capt. Brent Phillips with the ETPOA Leadership Award. On March 7, 2017 at 8:35a.m. Deputy Sanders was working patrol in Polk County, Texas and was assigned a threats call for service in a Polk County subdivision (Click here for original story). Deputy Sanders responded to the residence which was occupied by one adult male, two adult females and three small toddler age children. The complainants had received information that an estranged ex-boyfriend was coming over to the residence and had been told not to. In the process he had made threats of violence when he arrived. Deputy Sanders had completed his investigation and was about to leave the residence when the suspect arrived at the residence and pulled in behind Deputy Sanders vehicle. Deputy Sanders had attempted to approach the suspect when he opened fire on Deputy Sanders. Deputy Sanders took cover in front of his patrol vehicle and began returning fire. Gunfire between Deputy Sanders and the suspect continued for minutes. During this time Deputy Sanders was not able to reach out to dispatch through his handheld radio and initiated contact by cellular telephone and Bluetooth. Deputy Sanders remained on the telephone with dispatch during the shooting incident when the suspect pulled away from the residence. Deputy Sanders gave chase in his heavily damaged patrol vehicle. The suspect attempted to return to the original residence as Deputy Sanders continued to pursue. With Sanders in pursuit, the suspect continued to flee in his vehicle away from the residence. The suspect’s vehicle approached the entrance of the subdivision where he crashed with Deputy Sanders still in pursuit. Deputy Sander held cover over the suspect until more deputies could arrive where he was taken into custody. The initial assessment of this incident is extremely frightening for law enforcement who would have encountered this exchange of gun fire and survive. Deputy Sanders held the line on March 7, 2017, standing between six innocent victims and their impending assault or possibly death. Deputy Sanders pursued this suspect and was able to take him into custody while using enormous restraint. Stop having to buy new tires every six months! FIX IT ONCE AND FOR ALL! Deputy Josh Sanders (center) was proudly joined by Sheriff Ken Hammack (left) and Chief Deputy, Byron Lyons. 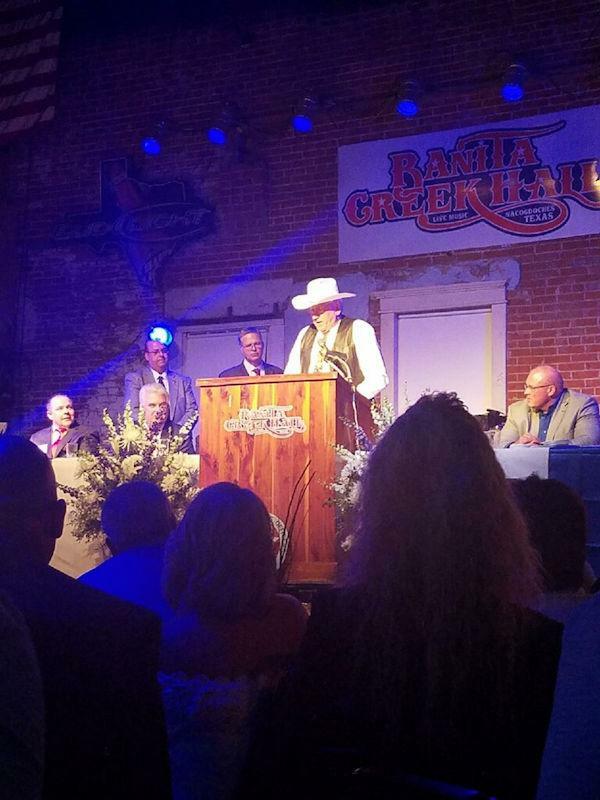 Captain Brent Phillips spoke to the audience after being recognized for decades of service. Captain Brent Phillips has a career that spans three decades of devoted time to public safety beginning in 1985 in Trinity County. Captain Phillips worked his way up through the ranks with the Trinity County Sheriff’s Office until being elected Sheriff of Trinity County. 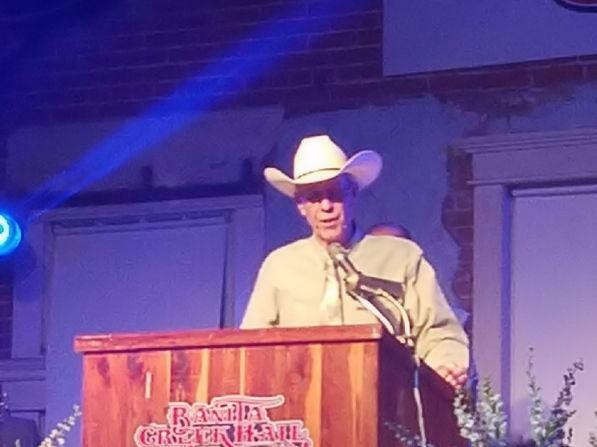 Phillips served as Sheriff for 11 years in Trinity County as well as serving on numerous civic organizational board of directors. Phillips has dedicated his life to the betterment of not just his community but of communities across Texas with an emphasis on the youth and their education. Capt. 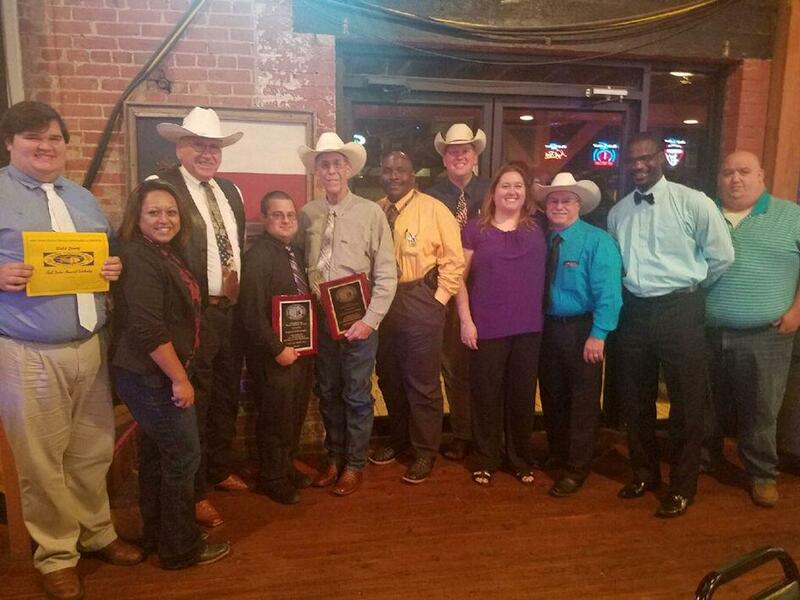 Phillips’ tireless efforts with the Houston Livestock and Rodeo has benefited youth from across this state with millions of dollars in scholarships. In 2005, Phillips came to work for the Polk County Sheriff’s Office, serving in the capacity of Jail Administrator. Since coming on board, Phillips has dedicated his blood, sweat and tears to the Polk County Sheriff’s Office. Phillips helped oversee construction of a 19 million dollar jail and law enforcement center. He oversees 57 full and part time staff members. Phillips has been a champion for the betterment of law enforcement and the rolls we play in the public outside of our official duties. Phillips is the immediate past President of the Texas Jail Association where he has been an advocate of the importance of training and educating our Jail and Law Enforcement Staff. In the climate we live in today, Phillips understands educating and training of our brothers and sisters in law enforcement is the best line of defense. The Polk County Sheriff’s Office is proud to serve with Capt. Phillips and Deputy Sanders and are extremely proud of this recognition and support. 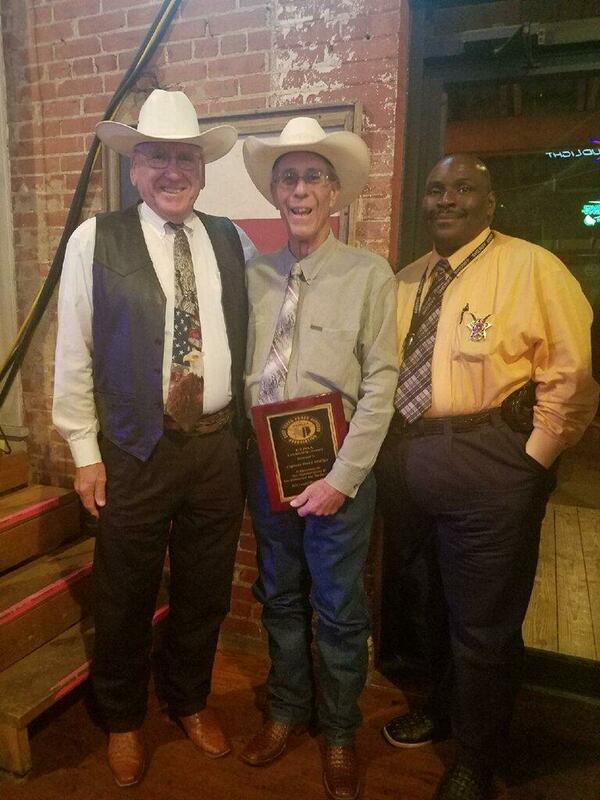 Captain Brent Phillips flanked by Sheriff Hammack and Chief Byron Lyons.